This page includes BKA Content reviews of users as well as an official review by ContentHeat in which we carefully analyze and write out our experience. 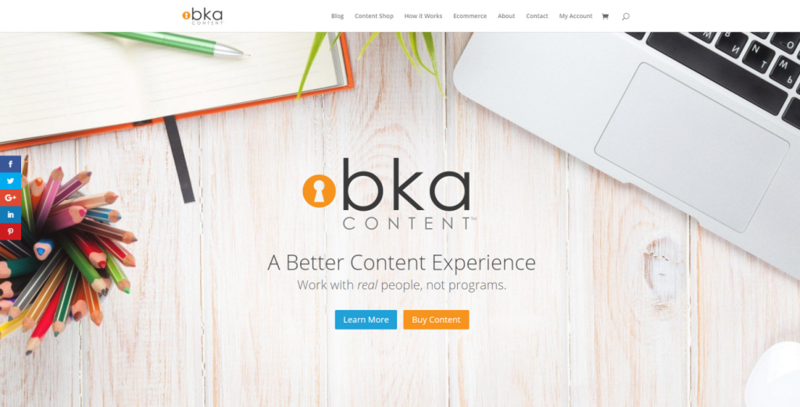 The BKA Content website sports a sleek, modern design which you’d expect to see from an active and popular content writing company. 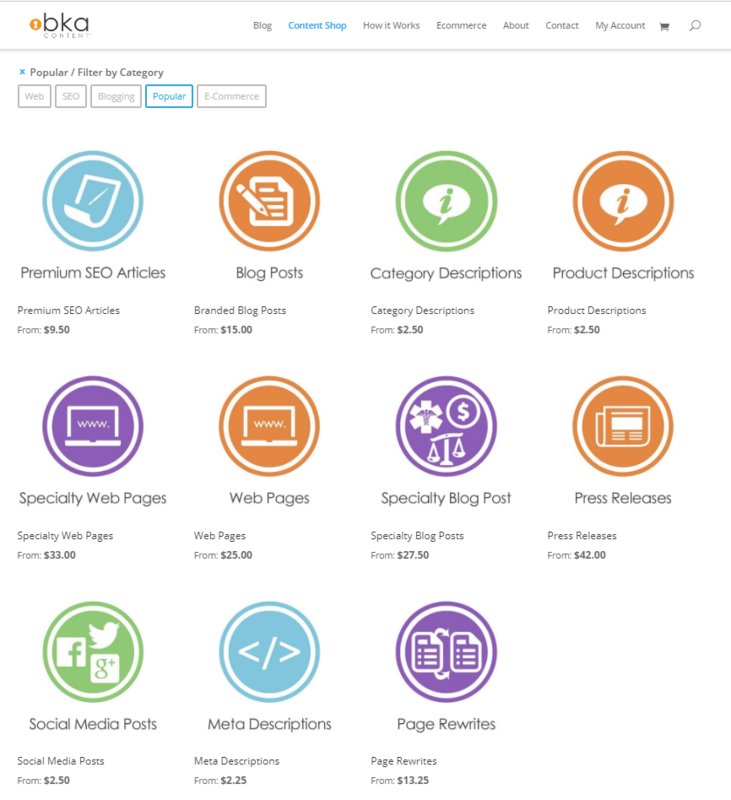 As for the actual content present on the homepage, it was nothing but quality copywriting – concise, to the point and listing the company’s biggest strengths. There were no generic empty promises and hollow boasting in sight, something that can often be seen in copywriting samples by sub-par services. Orders are placed through a clean and minimalistic ‘Content Shop’ which displays all the different types of content that can be ordered. The order screens for each particular content type allow you to pick a word count, which is done through a drop menu and a set of oddly specific predetermined options. This word count is the primary determiner of the final price, with no quality levels to be selected, seeing as BKA Content is an in-house writing company that only employs those who fulfill their standards. As such, you’re getting the best possible quality as a default. 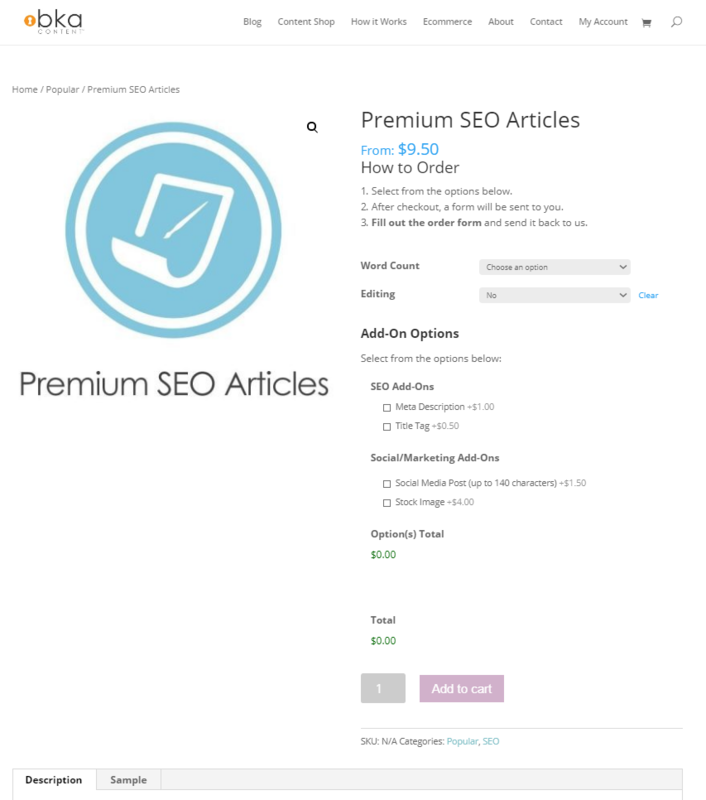 Apart from the base price set by the word count, the cost is further modified by an ‘edit’ option which charges 1.5 cents per word, as well as several other add-ons which charge extra and can be seen in the above screenshot. An unusual thing about the BKA order process is that the details of your order are not supplied with the order itself. 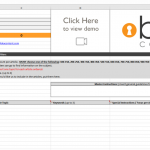 Rather, you receive an Excel sheet at your registered email address after paying, and you’re supposed to send it back to them after filling it with the required information on the content you ordered. This amounted to a price of $77.50 without any additional add-ons or editing. As I already said, BKA is quite a reputable company, employing only hand-picked in-house writers. Combine that with the price tag of almost 80 dollars, it is obvious why I think that anything short of excellence could be considered a rip-off. What I ultimately wanted to see was a piece with in-depth research and an eloquence becoming of a skilled native writer. I was willing to overlook the occasional grammar mistake seeing as we did not pay for the extra editing option. There was no estimated turnaround time, but the article was delivered in a timely manner, 3 days after ordering. With a word count of 1500 which is all quality content without any word stretching or generic filler statements, this delivery time is more than acceptable. My expectations turned out to be mostly accurate. The article was indeed written by a native, and written very well at that. The writing flowed well, apart from a missed connecting word or two, and all sentences and paragraphs had clearly defined points. A couple of grammar mistakes and oversights were present, but seeing as we didn’t pay extra for editing as previously stated, I don’t see it as too big of a shortcoming. Furthermore, the article was organized exactly per our instructions and the research was well done for the most part. One or two services on the list were not quite high-ranking, but all of them were very well described, and in a single paragraph per entry for that matter. Again, instead of presenting generic and irrelevant info about each company, they highlighted specific things about each one that set them apart and that might attract clients. I don’t have anything substantially negative to say about BKA Content, seeing as the only shortcomings in their article were legitimate grammatical overlooks and errors that anyone can make. After all, that’s what editing is for. All in all, if you want quality and you can afford it, I can confidently say that BKA is a great choice. 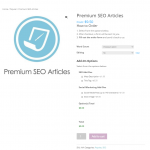 It is worth noting that even though an 80 dollar price of a 1500 word article appears to be quite high, it is still lower than the prices of some of their competitors.